If you’re one of my newsletter subscribers (subscribe at the bottom of this post) then you know I’ve been talking a lot about chartering your own course. Even here on the blog I’ve been hard at work creating more quality and valuable content for you guys. You see, I’m experiencing a turning point in my life and business, and as a result I’ve changed my perspective to think more strategically. I’m in a place where I need to grow my business and blog, financially provide for my family all while I’m still defining my niche and the value I bring. And that no matter what anyone says is not an easy task! It was time to come up with clear strategies and defined actionable steps to re-engage you [my audience] and grow my business each month. I needed to re-evaluate how you were going to gain value - every time you interact with me and brand. I do understand that struggles are real. And so while I’m not where I need to be, my goal is to be transparent about my struggles and how I’m finding solutions and navigating through them. So while most people forget to share the struggle part of their story, I want to remind you to remain authentic to you and grow where you are. Don’t let the glam that most people sell you online, make you think you need to be perfect. I shared in the past about how once I figured out what success meant to me things got easier… But while I was turning a profit, I needed to figure out how to now take my business and blog to the next level - as I was starting to feel stuck. And so I recently shared with you the importance of frequently revisiting your why and goals. I want you to understand that while you may be passionate, passion alone is not going to be enough to have success in life, career or business. You will also need clearly defined strategies to get you there. Whether you’re looking to advance in your job or grow your business and ultimately life, there are going to be struggles. 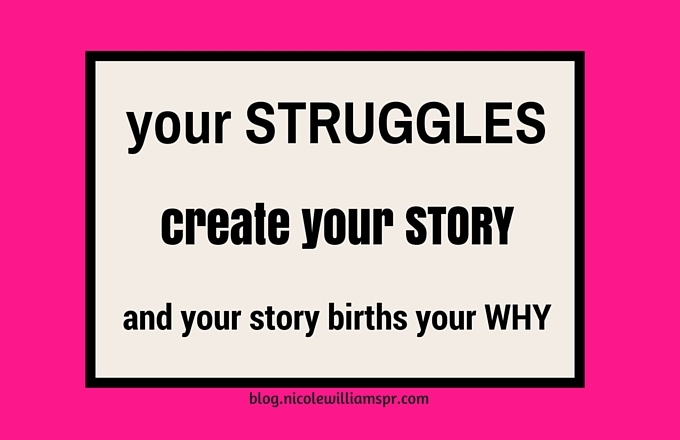 And those STRUGGLES are what create your STORY, and story gives birth to your WHY. How are you using your struggles to build credibility?